The Best-Kept Secret of the Neapolitan Tie : That's how we can define Francesco Marino's aerial ties. Marino, a name only known by the happy few of the luxury industry makes for more than 70 years amongst the best and the slightest ties in the world for some of the biggest names of the men's elegance. If those names cannot be given due to professionnal confidentiality, some of the patterns used are recognizable among all. He operates behind the curtain to produce his ties, scarves and pocket squares for famous luxury brands all around the world. 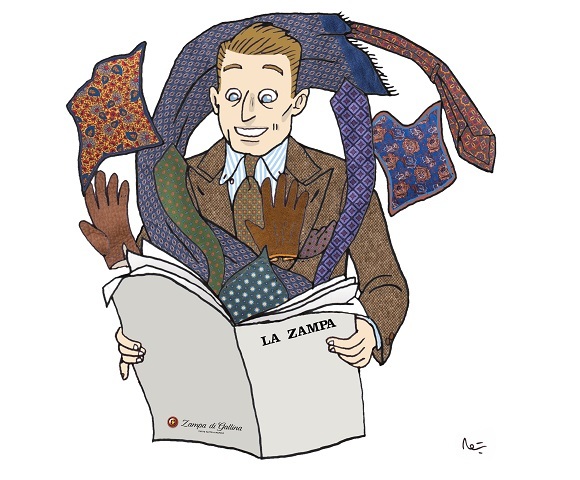 Given The in-house Stock of vintage fabrics Zampa di Gallina asked Francesco Marino to create a Limited Edition of pocket squares chosen from his own collection of fabrics. They are hand rolled and only a few pieces are available.